It's been more than six months! No one could ever forget the devastation caused by Typhoon Haiyan, popularly known in the Philippines as Yolanda. One of the world's strongest tropical cyclones left my husband's hometown, Tacloban, all knocked out. Super Typhoon Yolanda may have ravaged Tacloban's beauty, but not the people's strength. Through the efforts of the Taclobanons along with the support given by the international community, the government and non-government organizations, Tacloban is starting anew. It has been a struggle, yet the city is slowly making its way back on its feet, ready to rise again. I always see Tacloban as a city where a great promise was fulfilled; a city with an incredible history of hope and strength. I think that explains why most Waraynuns possess a strong character. They are bound to stand up no matter how hard or how many times they fall! Most have lost their homes, some even lost their loved ones and friends during the typhoon, but as you've seen on TV, none of the tragic events can break them. Even in times of despair, Taclobanons were able to organize various programs to help their fellowmen and to return the glory of their beloved city. WARAY nga RUN is a whole day activity which starts with 7k running and 14k biking event. The sports events will be followed by a Solidarity Street Fest with exhibits, shows and competitions. In the evening, there will be a Solidarity Festival, a concert filled with music, lights, colors and entertaining perfomances by artists from Tacloban and Manila whose aim is to uplift the spirits of the Tacloban people. All of the activities will be held in Balyuan Ampitheater, Tacloban City. The organizers of this activity is the Youth for a United World, a group of young people scattered across five continents of different ethnicity, nationalities and culture, belonging to various religious denominations or do not profess a religious belief, but are united by the desire to build a more united world using every available means to bridge divisions among all generations, backgrounds and levels to make humanity into a family where personal identity is honored. It's never too late to extend a helping hand! 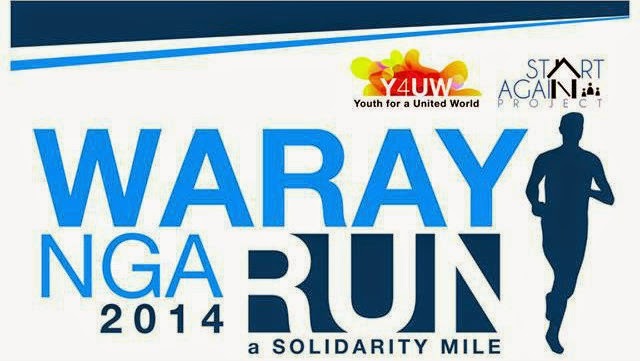 Even though you're miles away from Tacloban, you can still support WARAY nga RUN. Visit facebook.com/WARAYngaRUN2014 or contact our event coordinators Daryll Jove Opina (+63 915 450 1285 - Tacloban) and Karelle Anne Bulan (+63 917 599 9459 - Manila) to know the details. Share the LOVE! Dalagan kita!